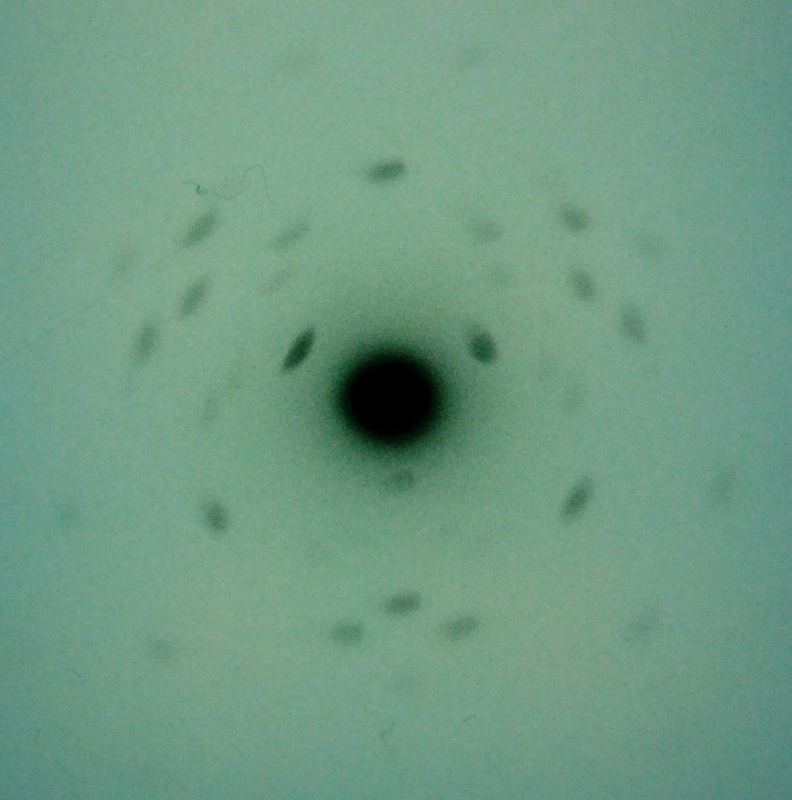 Laue diffraction pattern, in X rays, a regular array of spots on a photographic emulsion resulting from X rays scattered by certain groups of parallel atomic planes within a crystal. When a thin, pencil-like beam of X rays is allowed to impinge on a crystal, those of certain wavelengths will be oriented at just the proper angle to a group of atomic planes so that they will combine in phase to produce intense, regularly spaced spots on a film or plate centered around the central image from the beam, which passes through undeviated. 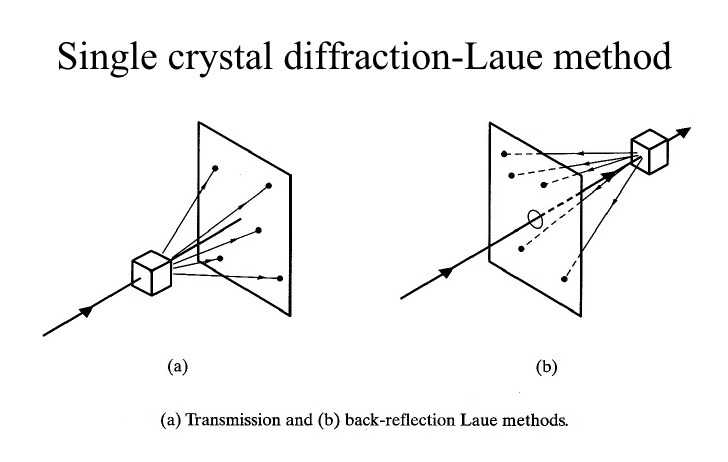 Laue patterns, first detected by Max von Laue, a German physicist, are invaluable for crystal analysis. where is the inter-atomic distance and is the difference between the incident and the diffracted wave vector (the interaction is elastic scattering so the incident and diffracted radiation have the same energy so the module is constant). In this way the Laue condition indicates that, in an elastic collision, the moment transferred to a crystalline lattice is equal to a vector of the reciprocal lattice. 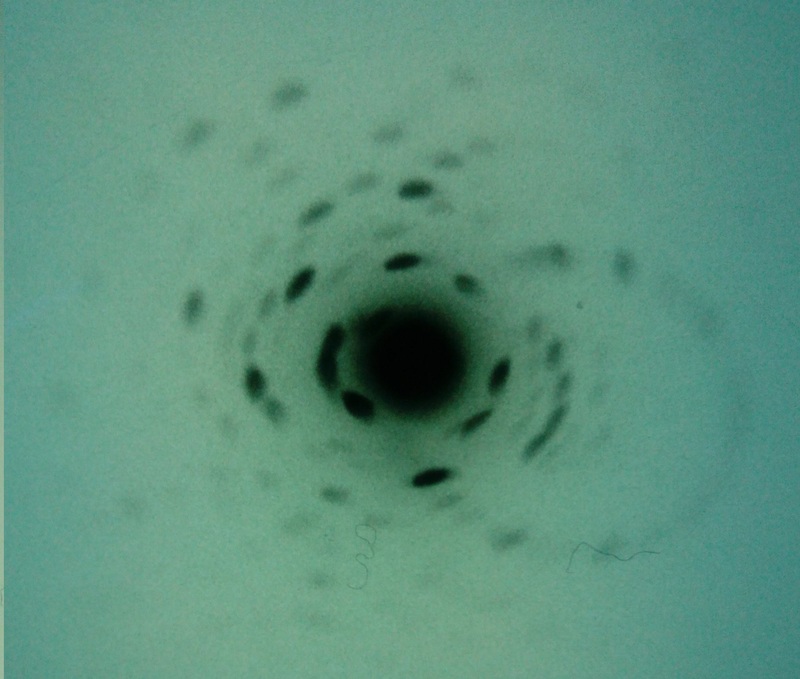 The spots present in a Laue diffractogram correspond therefore to the reflections (constructive interferences) produced by a set of crystallographic planes. The Laue image is therefore a direct representation of the reciprocal lattice and each spot corresponds to a point of the reciprocal lattice, corresponding in turn to a set of crystallographic planes. 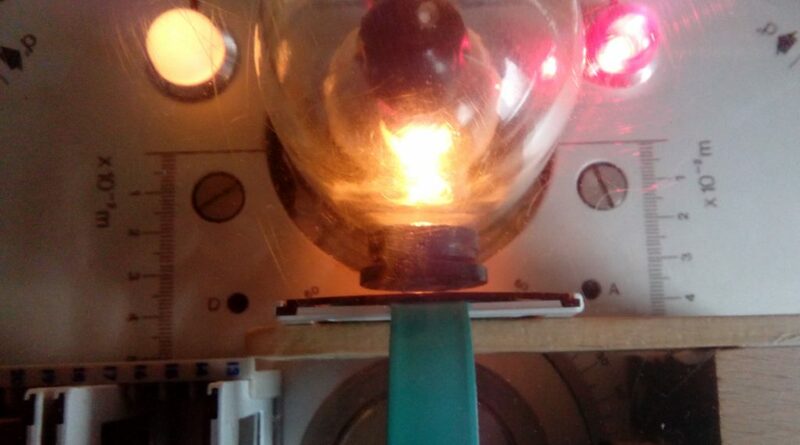 For the occurrence of the von Laue condition it is necessary that the incident beam is polychromatic, that is, it contains all the wavelengths that potentially satisfy the constructive interference condition. The image below shows the basic scheme of the two methods. The image obtained is linked to the structure of the crystal lattice and its symmetry properties. Usually the spots are arranged along the ellipses which are the intersection of the diffraction cones with the plane of the photographic plate. The image below is the computer simulation of the diffraction pattern that is obtained from an fcc cubic crystal in which the beam is parallel to an axis of symmetry of the crystal. The symmetry of the figure is evident for rotations of angles of 2π / 4 around the axis perpendicular to the plane of the image. 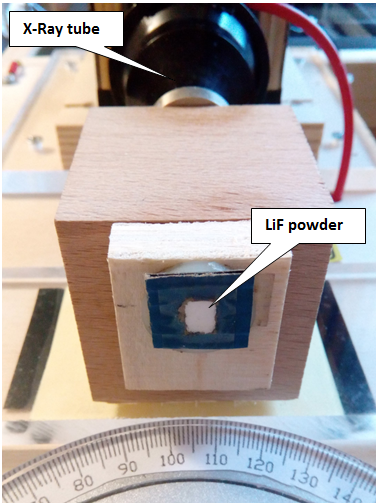 The Laue diffraction tests were carried out both with the Teltron diffractometer and with the DIY diffractometer. The images below show the two setups. 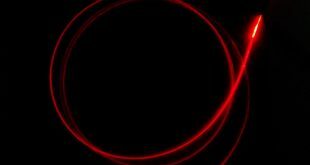 In both cases a Φ 1mm collimator is used in order to produce a collimated X-ray beam. The sample under analysis is positioned at the exit of the collimator, the photographic plate is placed at a distance of 1 – 2 cm to collect the diffraction spots. 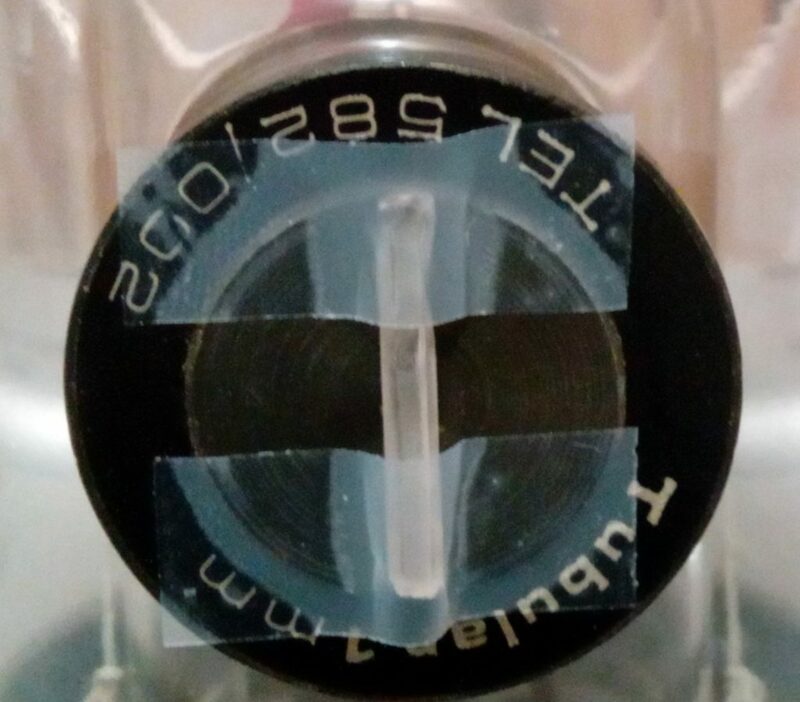 It is important that the sample under analysis is very thin (for example 0.5 mm) so as to reduce the absorption of the beam inside the sample. Given the low intensity of radiation X it is necessary to expose the plate for a long time (for example 1 – 3 hours). 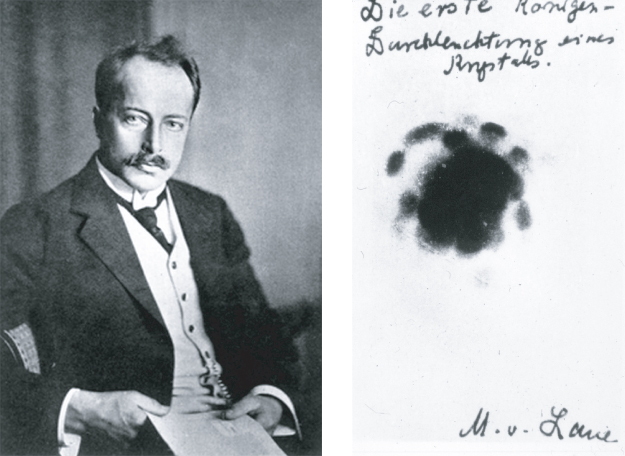 As done in 1912 by Max von Laue, Paul Knipping and Walter Friedrich, we at PhysicsOpenLab did the first diffraction tests using copper sulphate. 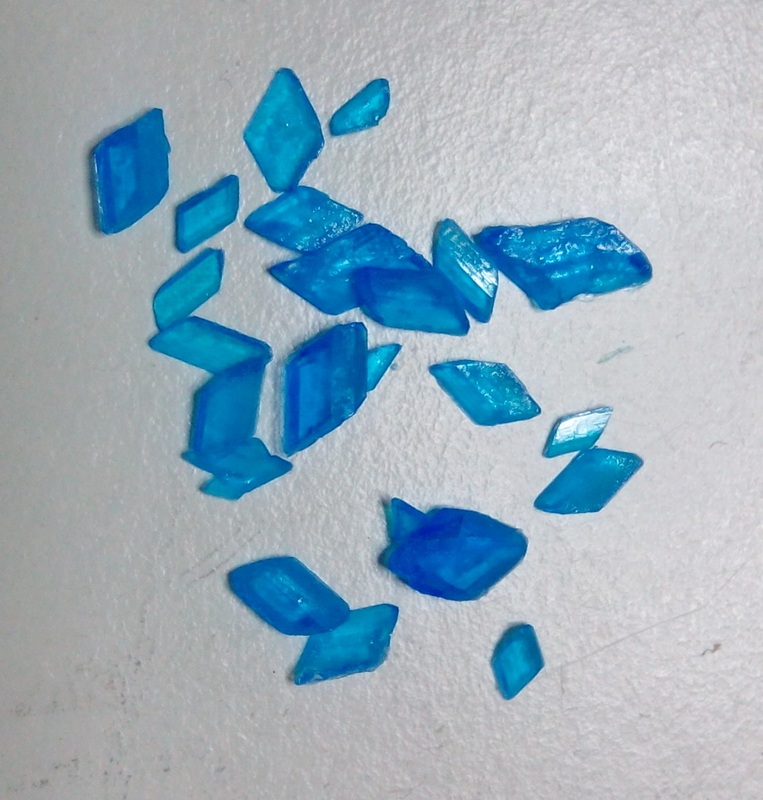 The crystals were obtained by evaporation from a supersaturated solution. 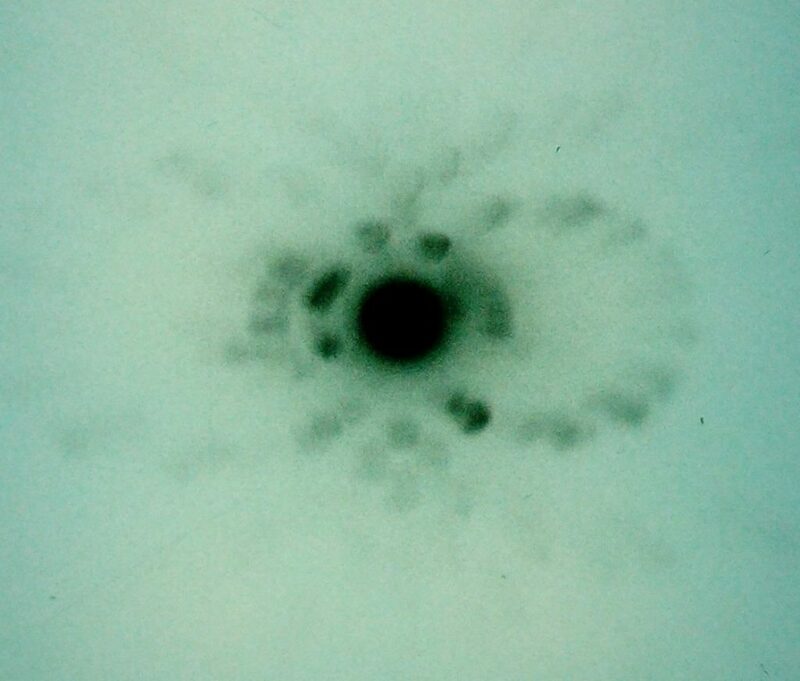 The images below show the crystals and the diffractogram with some diffraction spots. 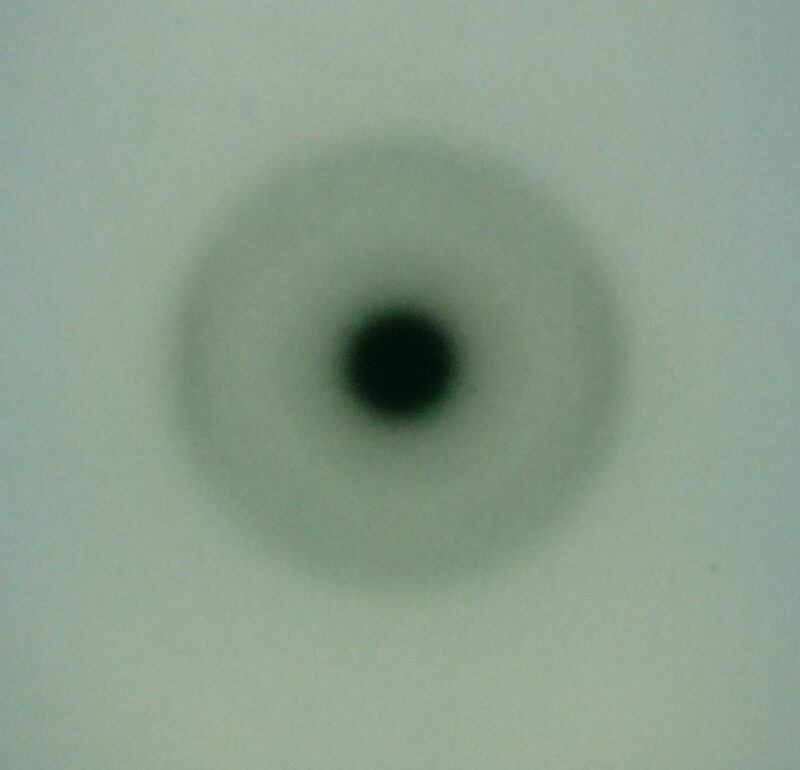 Laue Pattern obtained with a sodium chloride single crystal sample (100) oriented. 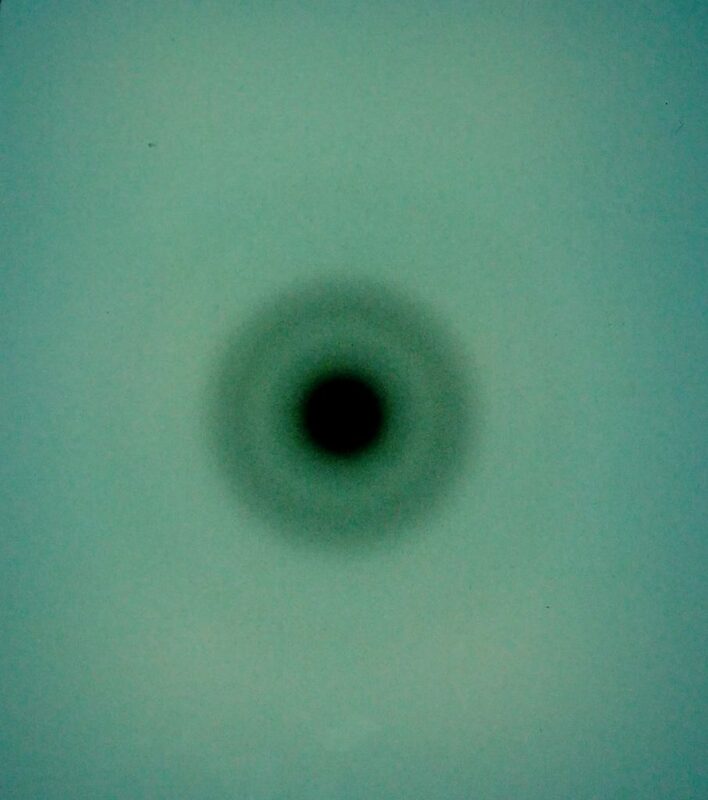 Exposure time of 2 h. Copper anode x-ray tube, Va = 30 KV, Ia = 60 μA. The symmetry for rotation of 2π / 4 characteristic of the cubic structure is evident. The image below shows the Laue diagram of a NaCl (100) single crystal with a face-center cubic crystal lattice (fcc). If the diffraction pattern is rotated by 90° around the direction of the primary beam, it is again brought to coincidence. Since the primary beam impinges perpendicularly on the (100)-plane of the NaCl crystal, the crystal direction  is a fourfold axis of symmetry. The intensity of the reflections depends on the reflecting crystal surface as well as on the spectral intensity distribution of the X-rays. 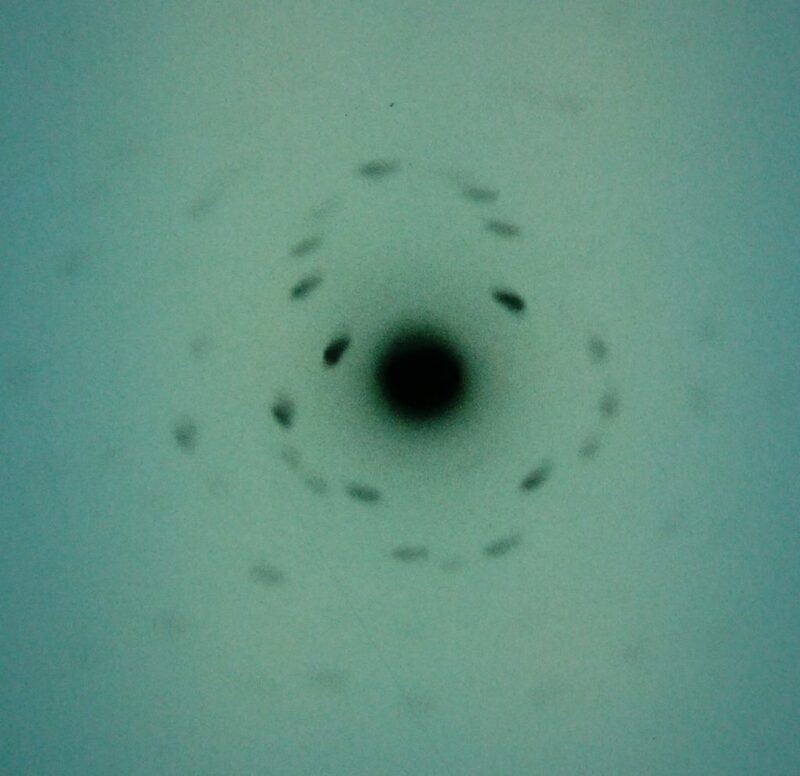 Laue Pattern obtained with a single crystal silicon sample (100) oriented. 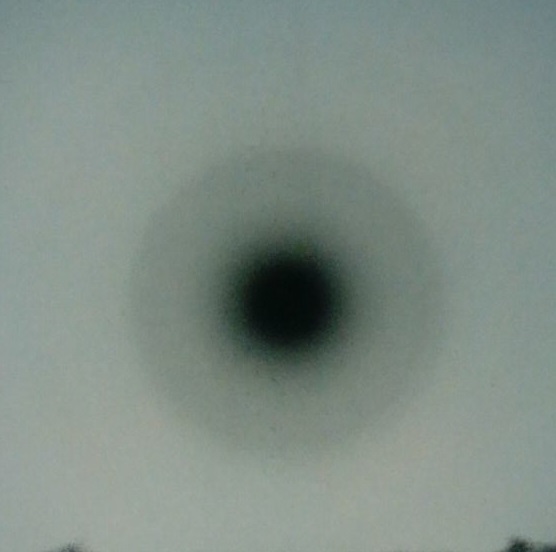 Exposure time of 1 h. Copper anode x-ray tube, Va = 30 KV, Ia = 60 μA. The symmetry for rotation of 2π / 4 characteristic of the cubic structure is evident. Laue Pattern obtained with a single crystal Fluorite sample (111) oriented. Exposure time of 2 h. Copper anode x-ray tube, Va = 30 KV, Ia = 60 μA. The threefold symmetry for rotation of 2π / 3 characteristic of the cubic structure oriented on the diagonal of cube is evident. 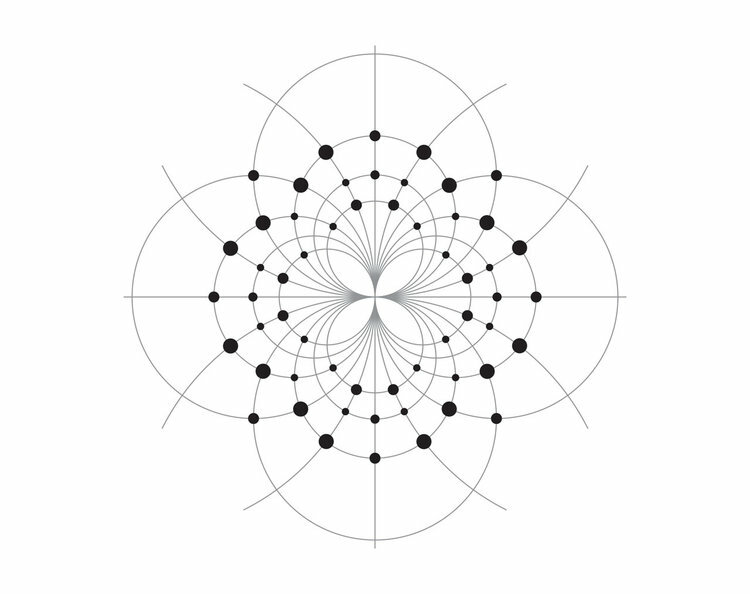 Laue Pattern obtained with a single crystal Quartz sample (100) oriented. Exposure time of 2 h. Copper anode x-ray tube, Va = 30 KV, Ia = 60 μA. Laue Pattern obtained with a single crystal Gypsum sample (020) oriented. Exposure time of 2 h. Copper anode x-ray tube, Va = 30 KV, Ia = 60 μA. 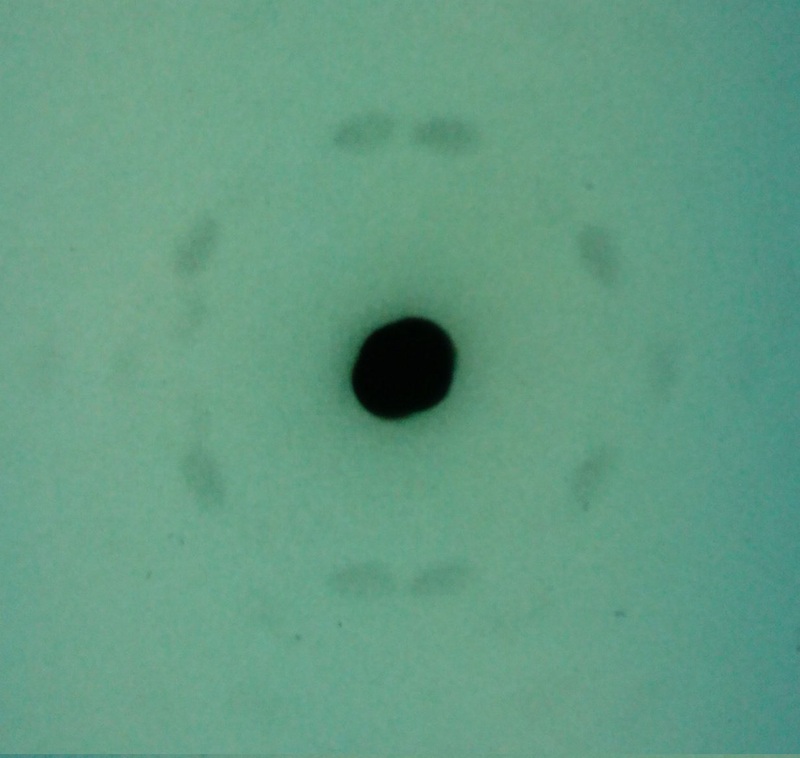 Laue Pattern obtained with a single crystal Sphalerite sample (100) oriented. Exposure time of 1 h. Copper anode x-ray tube, Va = 30 KV, Ia = 60 μA. Sphalerite ((Zn, Fe)S) is a mineral that is the chief ore of zinc. It consists largely of zinc sulfide in crystalline. Evident the four-fold simmetry, feature of cubic crystal cell. 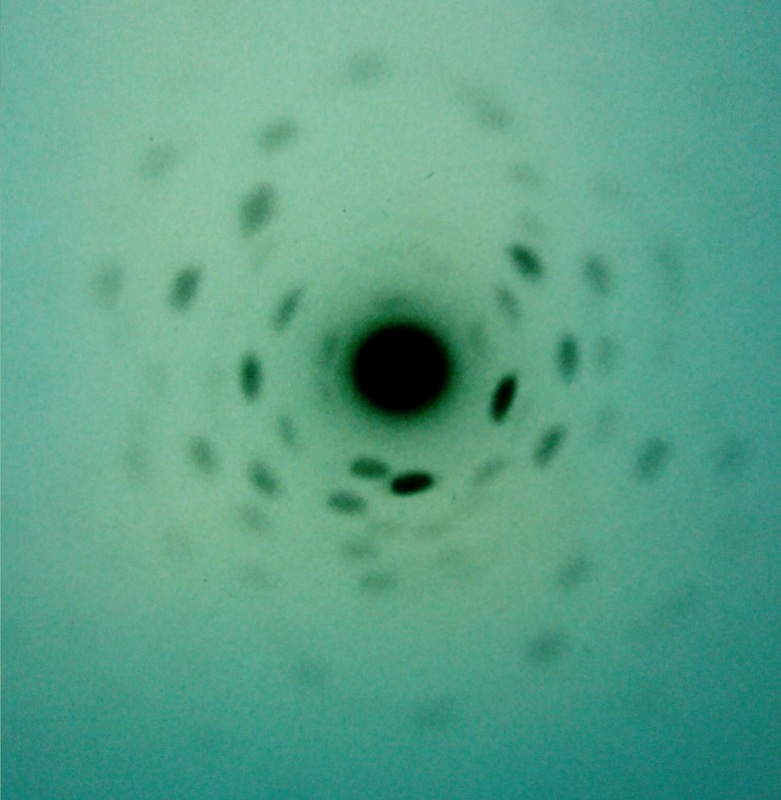 Laue Pattern obtained with a single crystal Pollucite sample (400) oriented. Exposure time of 2 h. Copper anode x-ray tube, Va = 30 KV, Ia = 60 μA. Pollucite is a mineral belonging to zeolite family. Laue Pattern obtained with a single crystal Calcite sample (104) oriented. Exposure time of 2 h. Copper anode x-ray tube, Va = 30 KV, Ia = 60 μA. 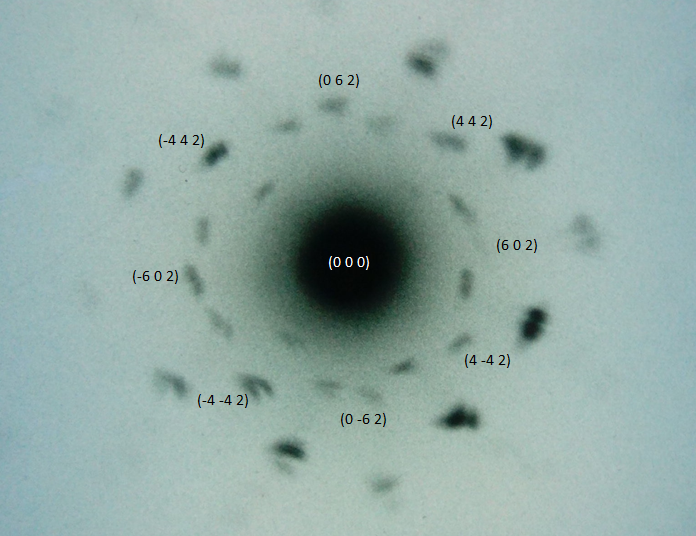 In the powder diffraction method, the crystalline species under examination, in the state of very fine dust, is hit by a beam of monochromatic X-rays. Each particle is a minute crystal randomly oriented with respect to the incident ray, ie all the lattice planes are in a position to be able to reflect at the same time as if it were a single crystal that rotates around all the possible axes. For each lattice plane a diffraction cone is then generated having a half-circle of 2θ which hits the film placed around the sample. The intersection of this cone with the photographic film determines a curve similar to a circle: it would be exactly a circle if the film were placed on a plane orthogonal to the incident beam, rather than on a cylinder. The diagram shown below illustrates this method, known as Debye-Scherrer method. 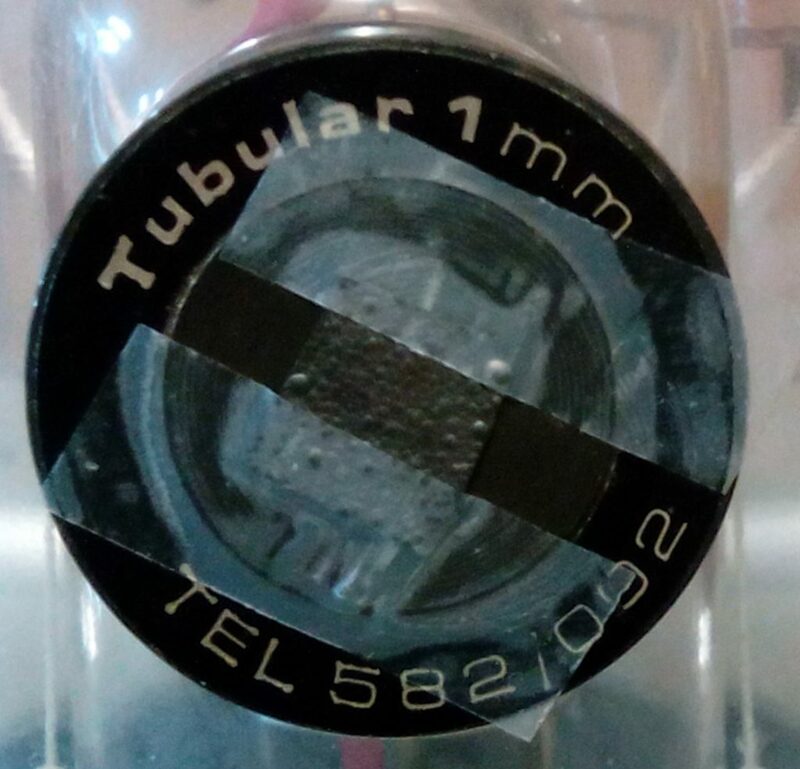 In our case we did not use a cylindrical film as in the diagram shown above but we used the usual films put immediately after the sample under examination. 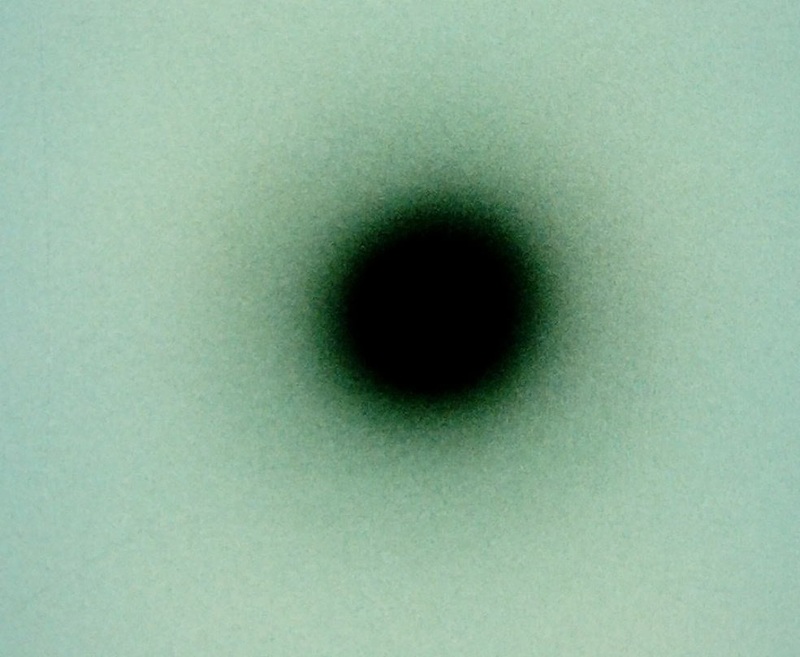 The image below shows a sample consisting of lithium fluoride powder. Laue Pattern obtained with a sample of pyrolytic graphite. Exposure time of 2 h. Copper anode x-ray tube, Va = 30 KV, Ia = 60 μA.